What if I tell you now that by do more internet banking and play FB game (either on your computer or mobile phone) you can win great prizes? How bout tons of cash prizes including a legendaey Ducati monster 795? 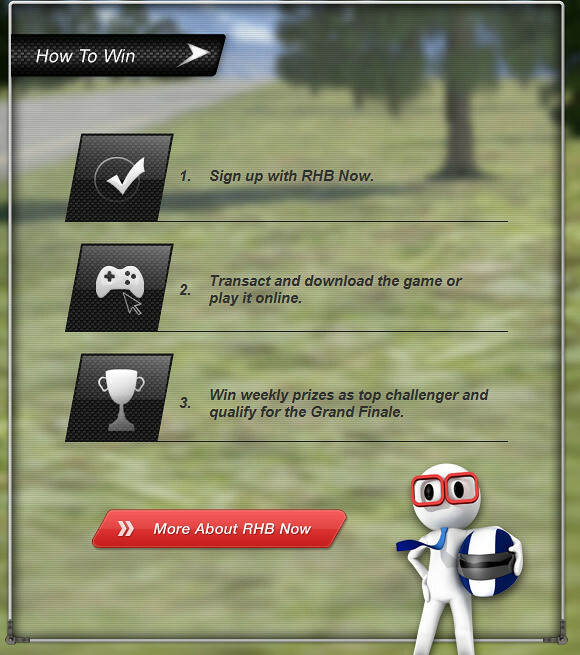 The RHB Now Racer is a game developed by RHB Now for customers to win exciting prizes. The game can be played numerous times, however the scores will only be recorded when you make transactions on RHB Now, Internet & Mobile Banking. This promotion will be valid from the 20th of January until the 15th of March 2012.. RHB will be giving away 3 Ducati Monster 795, 7 consolation prizes as well as 10 weekly prizes to the top scorers. You need to sign up with RHB Now, transact and play the game online to win weekly prizes and qualify for Grand Finale to win one of three Ducati Monster 795! 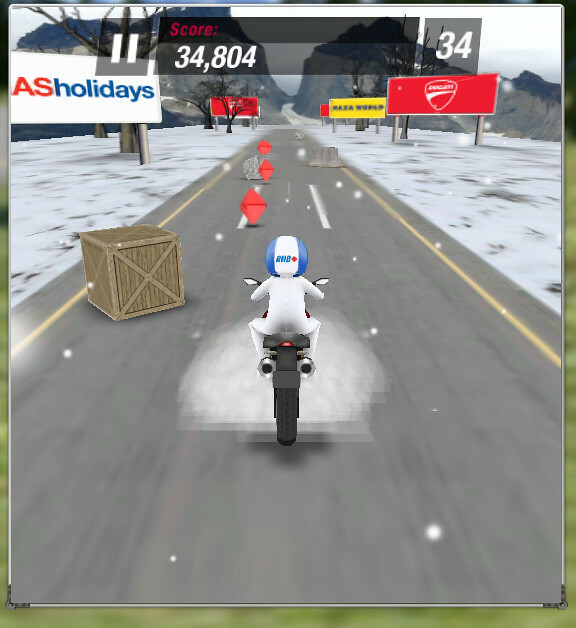 The RHB Now Racer is a simple yet exciting third person racing game which can be played via your Internet or mobile device. Take on the role of RHB Now’s Avatar riding a legendary Ducati bike. The objective is to maneuver along one of 8 racing tracks, which is unlocked weekly, whilst meticulously dodging and jumping over various obstacles along the way such as sticky tar on the road and giant spikes. To achieve high scores, you will need to pick up as much treasure as possible and cover as much distance as you can within the given time limit. It’s that simple! 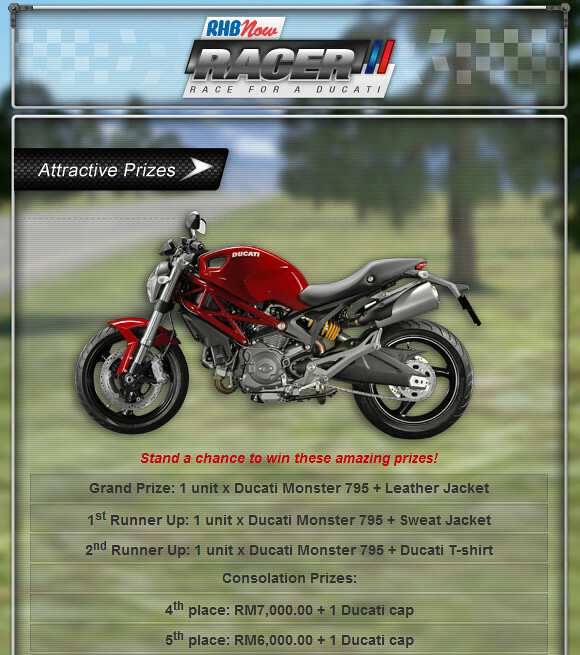 HOW TO WIN DUCATI MONSTER 795? Game Tips: You can actually double jump so you can float on the air avoid the obstacles =) Diamond give higher points but remember to avoid those obstacles as your travel distance give high score too. I'm gonna float in the air! My current high score is 69,252! 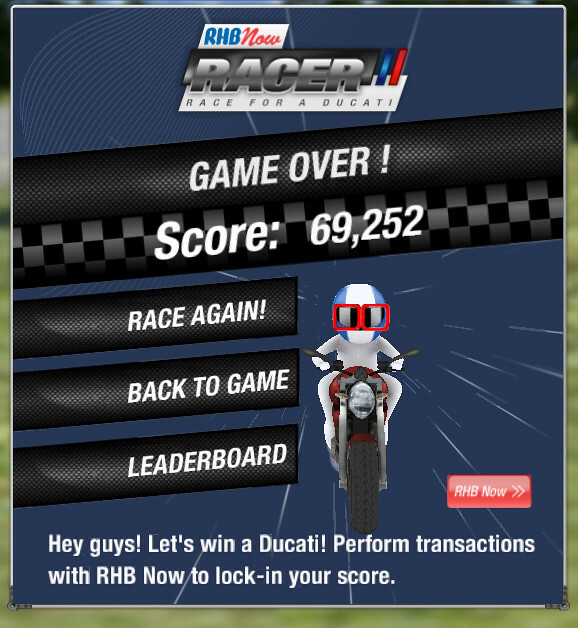 If you think you can beat my score, start playing now @ RHB Now Racer! 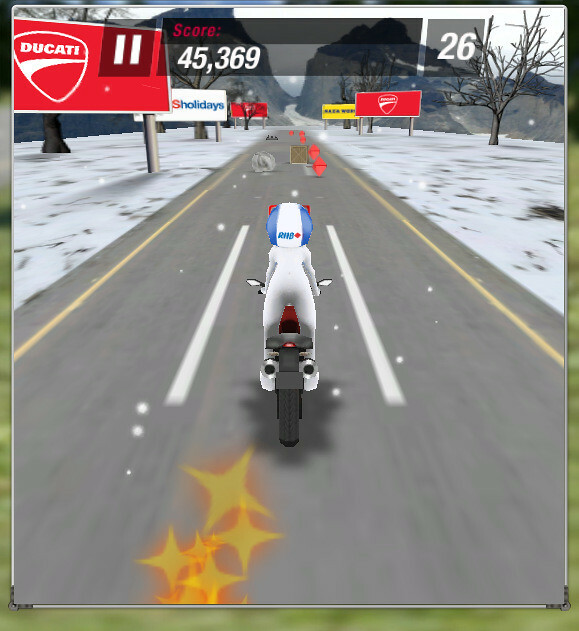 Race your way to a Ducati by playing RHB Now Racer!! Don't forget there are tons of cash prizes awaiting you too! Vroom vroom! Visit HERE now!